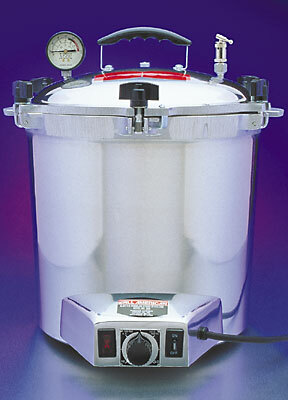 A complete, self-contained sterilizer with an immersion heating element, automatic thermostatic control, automatic release valve, and pilot light. Only a small amount of water is needed to create a dry steam. At a temperature of 259 degrees fahrenheit, it penetrates bandages or instruments making them steril in 20 to 30 minutes.